This blog addresses the challenges of coding poetry anthologies, but if you just need a one-stop primer on formatting a single poem for E-books, here it is. What did the barn owl see? Ask Cicero. “PoemLine” is my basic, go-to line. It is left-justified with a hanging indent. 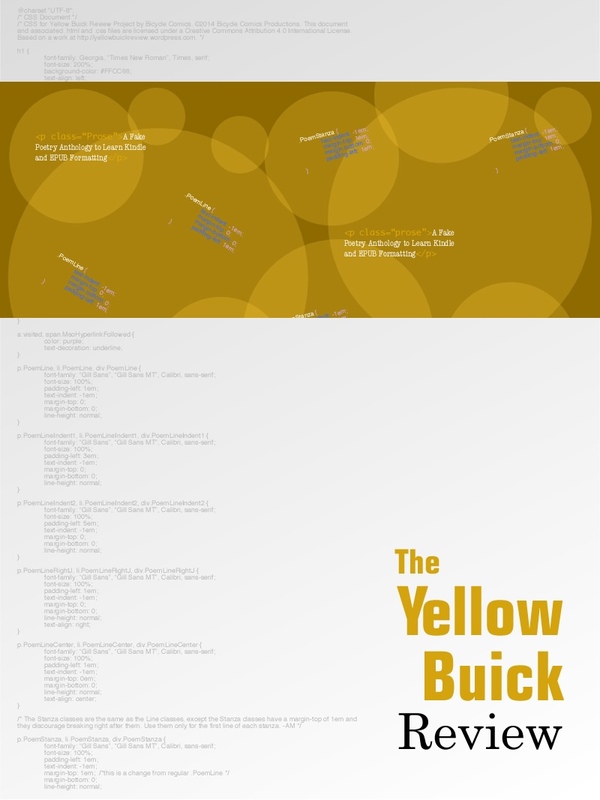 60% or more of all lines of poetry in Bicycle Comics’ anthologies are <p class=”PoemLine”>. “PoemLineIndent1” is indented by 3ems. There aren’t tabs in HTML, but it’s about “one tab” in from the left margin. “PoemStanza” is the class I use for the first line of each stanza. If a poem has four stanzas, it will have four <p class=”PoemStanza”> tags (3). “PoemStanzaIndent1” is the class I used for the first line of an indented stanza. “PoemDedication” is the class for dedications, epigraphs, introductions, or other quick notes at the beginning of a poem. I don’t care for dedications in poems, so I try not to use this very often. It is right justified and italicized. There are other classes I use for other, more complex poems, and anthologies are a whole other kettle of fish, but this covers 80% of what I use on a poem-by-poem basis. Some people want to add <div>’s on each stanza. Okay, but I don’t see the necessity. <p class="PoemLineIndent1">Now come seven syllables. That’s all there is to it. Wanna see? Try it yourself. Don’t forget to make your browser window really narrow so you can test the line breaks on the final two couplets. Updated July 28, 2014 with footnotes. (1) The people who creatively advocate using unordered lists for poetry stanzas out of a philosophical ideal of syntax have the right spirit, but they miss the point that poems are not lists of lines anymore than they are collections of tiny paragraphs. The Web was not designed for poetry; anything poetry does to render itself properly on the Web will therefore be utilitarian in its approach. (2) Liza Daly of Safari Books Online first clued me in to the value of treating each line of poetry as a unique unit, although in the end I chose the (p) tag as more appropriate for poetry (philosophically and semantically) than (span). (3) Portions of this CSS are derived from Liz Castro’s blog post on media queries, although the Bicycle Comics workflow doesn’t go down the media-query path. If you need to specify your formatting at the device level, Castro’s workflow is the way to go; it should get along pretty well with the CSS I’ve outlined here. (4) There are several ways to condense and combine rules to make these CSS classes much shorter. Please check out my other blog posts for tips on more efficient CSS. Once you have a plain text file, dress it up with MS Word Styles. Just be careful not to fall in love. 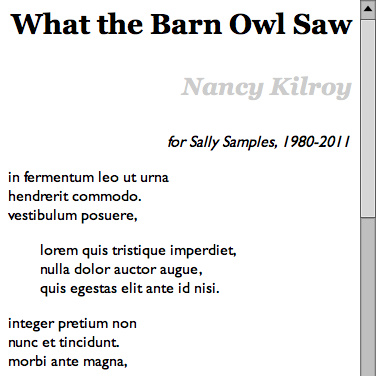 Again, that screaming sound you hear is from well-intentioned people (well-informed, even) who simply cannot abide the thought of using MS Word for any part of making a poetry E-book anthology. If you are comfortable in CSS/HTML, then you can ignore this post, and catch up with us once we get into the posts about line and stanza classes.